This section details changing a Clients permissions via the Client Details. have permission 5001 set to Permitted. By default this is only permitted in the System Administrator and Office Manager roles. Multiple practitioners can be given access to a Client by giving View or Edit permissions, however, only one can be selected as the Primary Practitioner. Manually changing the client access permissions for a Client / User combination will result in the Manual Update check box being ticked against that record. 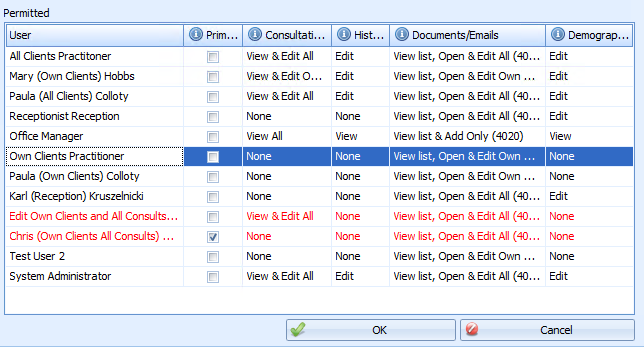 It can be viewed in the Client Access Permissions or Client Access Manual Update reports. Where a value of None is displayed, this means that the User/Practitioner does not have access to the Client. and then display in red when Clicking OK to save. Set the Demographic, History and Consultation rights so that the Practitioner can at least view these.